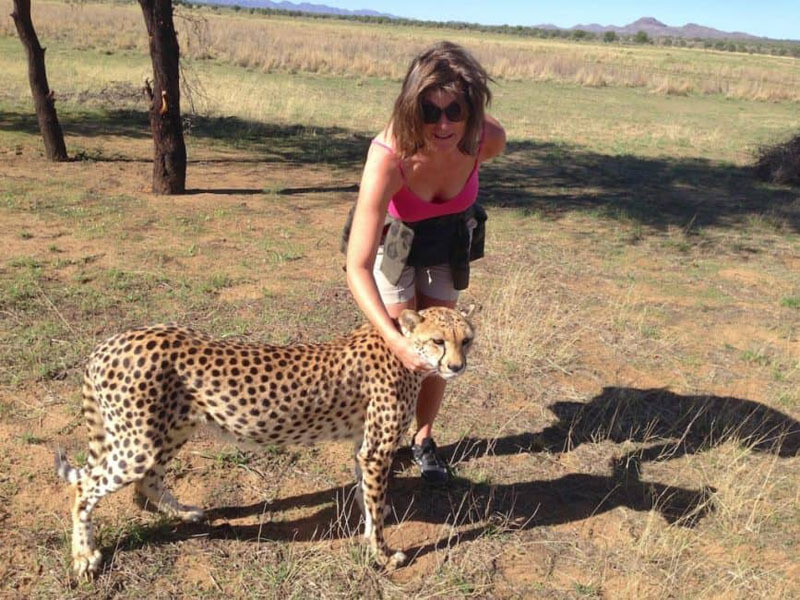 My Walk with Cheetahs, Learning from the Bushmen & Exploring one of the Most Amazing Conservation Projects in Africa! 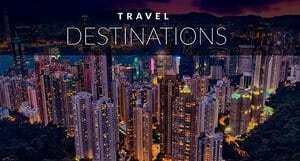 During my many years of traveling, I have come across a number of amazing projects and organizations. Yet, what I experienced in Namibia recently – at a place called “N/a'ankuse” – far surpassed them all, both in charitable concept and wildlife travel experience! “God is watching over us” That is the meaning of the San word “N/a’ankuse” and it beautifully describes the feeling that envelopes a visitor when first passing through the gates. 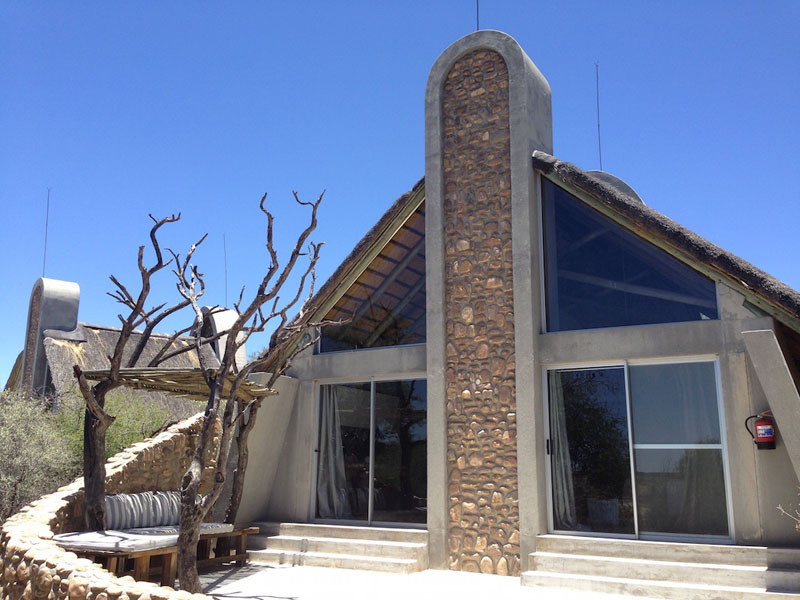 Located 40km outside of Windhoek, Namibia, and conveniently close to the international airport, it feels like worlds away from busy civilization. An oasis of peace and stillness and yet, also, of one of the most amazing charitable and eco-friendly concepts I have ever come across. Well…. N/a'ankuse Foundation covers 3 major areas, aiming to conserve Namibia’s spectacular wildlife, land and native communities. In addition, N/a'ankuse offers volunteers from all over the world the opportunity to participate and be rewarded with the experience of a lifetime. It all started in 2003 with a Lifeline Clinic for the San Bushmen after founders Marlice and Rudie Van Vuuren watched a San baby die due to lack of proper care (and interest) by the local hospital. 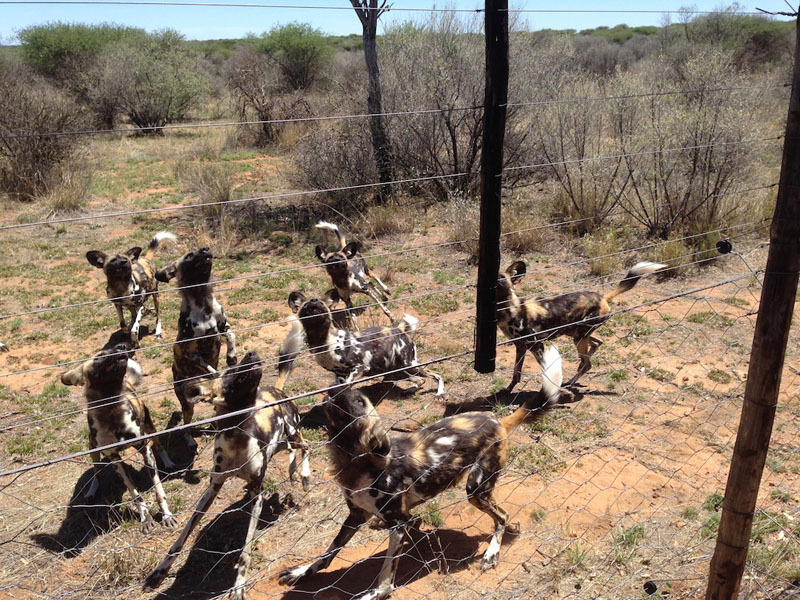 From there, a large property was purchased outside of Windhoek – 3,200 ha (8,000 acres) – to start a wildlife sanctuary for many of Namibia’s endangered species while providing employment for the San Bushmen community. N/a’ankuse Wildlife Sanctuary and Lodge was inaugurated in 2007, featuring 6 beautiful Guest Chalets and 10 Villas that can house an entire family, all spread out over the property for maximum privacy. That’s where I had the good fortune of spending some time recently. Inspired by wildlife Sanctuaries? 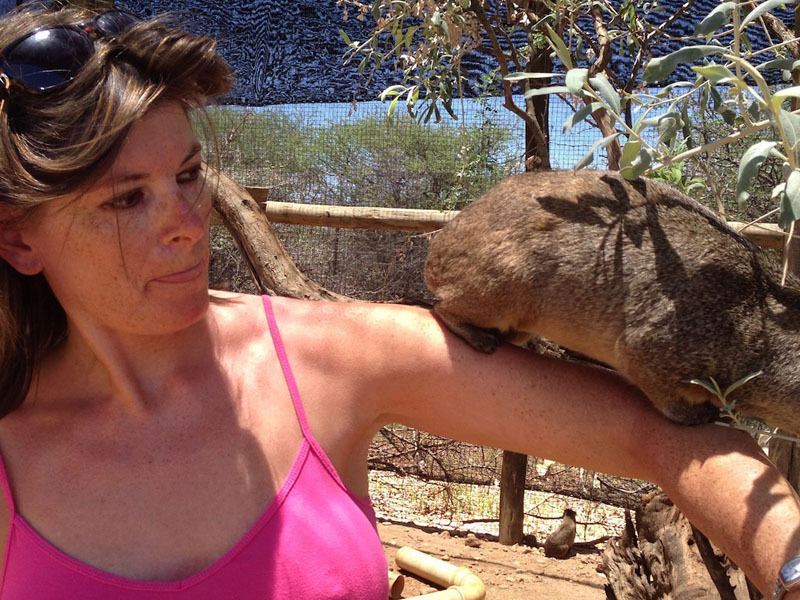 Read how Volunteering in Namibia changed this couple's life. The drive from Windhoek took about an hour and was mostly on gravel road, driving through lovely scenery. Once we reached the main gate, it took yet another 15 minutes to actually reach the main lodge building, that’s how remote it is…. The first thing I noticed were the solar panels over the parking lot, and it set the tone for everything else. The main building and 6 adjacent guest chalets impress with stunning architecture and interior design. 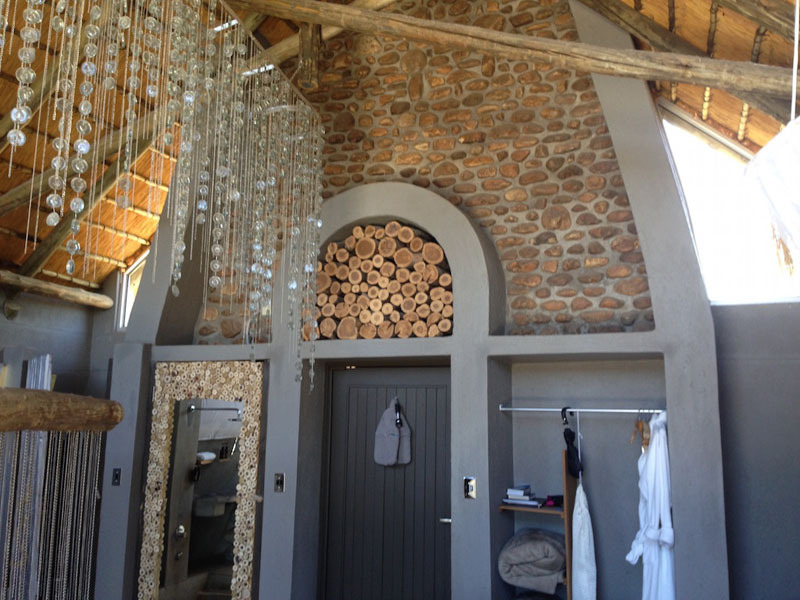 “Romantic Organic” is the name of this particular style, designed by Namibian architect Dirk Theunissen and Interior Designer Laurie Owen from Johannesburg. An eclectic blend of earth colors and grey, balanced with simple ornaments and an over-all cool, earthly vibe, stimulating calmness and comfort within stylish elegance. The conservation projects were already impressive, but having a superb sense of style to go with was a rare combination. After settling into my beautiful chalet and exploring all its many facets and little extras, I was greeted by “Fudge”, the cat. Just so you know, she runs the place and came to make sure I appreciated my surroundings and knew how all the appliances worked…. Wildlife is precious everywhere. Read about Wildlife Conservation in India. She also stayed the night, which was lovely, but is certainly not required if you don’t want her to. 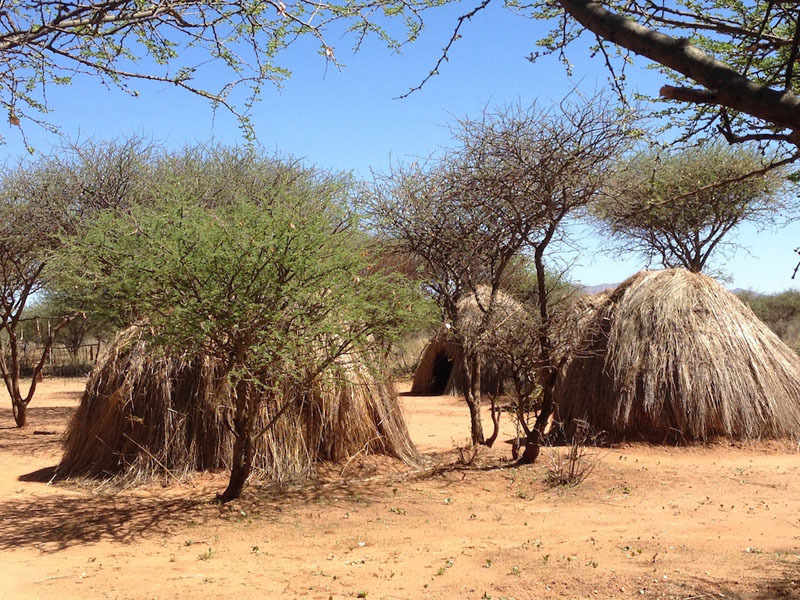 Next, I started my first “activity”: meeting the San Bushmen and going on a bush walk with them. I already mentioned the Lifeline clinic, and N/a’ankuse also provides employment and training for the San. In fact, almost all the employees at the lodge were San, including the Safari guides. There is also a school for San children – supported by the Jolie-Pitt Foundation – and scholarship programs for older children. Needless to say, the San love Marlice and Rudie and are deeply grateful for all they have done. My safari guide shared with me the next day how different the future looks for his children now, compared to his when he was their age. They now have options and can build a better future for themselves. He himself started as a guard at the gate and worked his way up to Safari guide – and he was an excellent one! More on that later…. 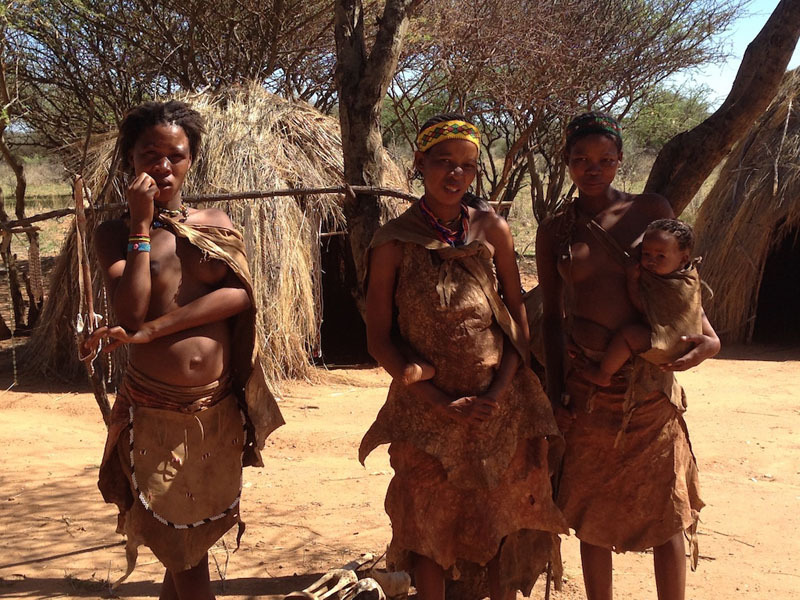 My encounter with the San Bushmen was delightful and fascinating. 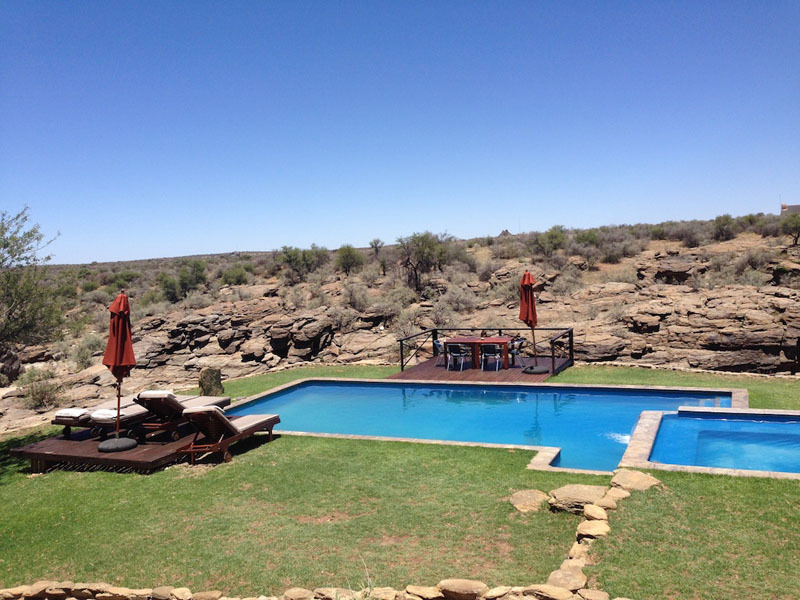 While the tribes mostly live in the Kalahari, a small group always rotates to N/a’ankuse for 3 months to meet the guests and take them on a bush walk. My guide served as translator and the communication was rather amusing – certainly for them…;-) – as I tried my best to pronounce their language with all the extra sounds. Next, we were taken on a bush walk and the San explained the different plants and how they use them in their daily life (tasting included). The most important plant was the water root which they dig out of the ground and then eat for hydration. It was rather tedious for them, because the earth around Windhoek is much rockier and the plants much smaller, but in the Kalahari they are huge and easy to dig out and an important ingredient in desert survival. I was also shown how to make fire – really fun! 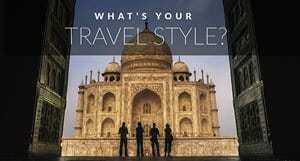 – and learned more about their culture and daily lives. Altogether, an absolutely wonderful afternoon that I would highly recommend to include if you ever stay at N/a’ankuse. I enjoyed a delicious meal of African specialties and then retired to my beautiful chalet to enjoy an evening on the porch. Fudge joined me and also spent the night. The next day was devoted to wildlife activity and I strongly recommend that you spend at least two days at this wonderful place, more if you can. 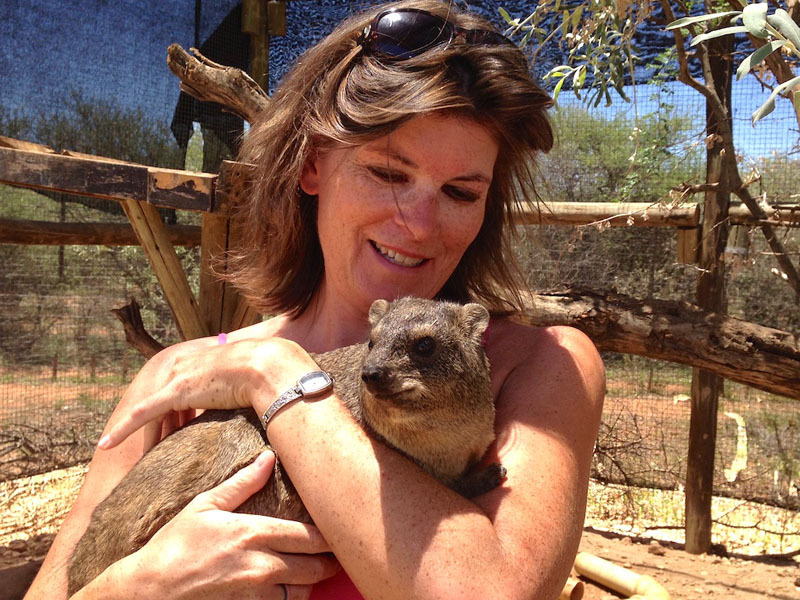 Marlice Van Vuuren is a well known wildlife conservationist in Namibia and grew up on her parents’ sanctuary. Concerned about dwindling wildlife numbers, N/a’ankuse was built as a wildlife sanctuary, particularly for big cats. Much education and conversation has been done with Namibian farmers to convince them not to kill leopards, cheetahs and lions, but rather capture them alive and then hand them over to N/a’ankuse. This is working more and more effectively and so far more than 150 wild cats have survived prosecution thanks to N/a’ankuse's efforts. Whenever possible, they are relocated to areas where they are less of a threat to farm animals and released back into the wild. 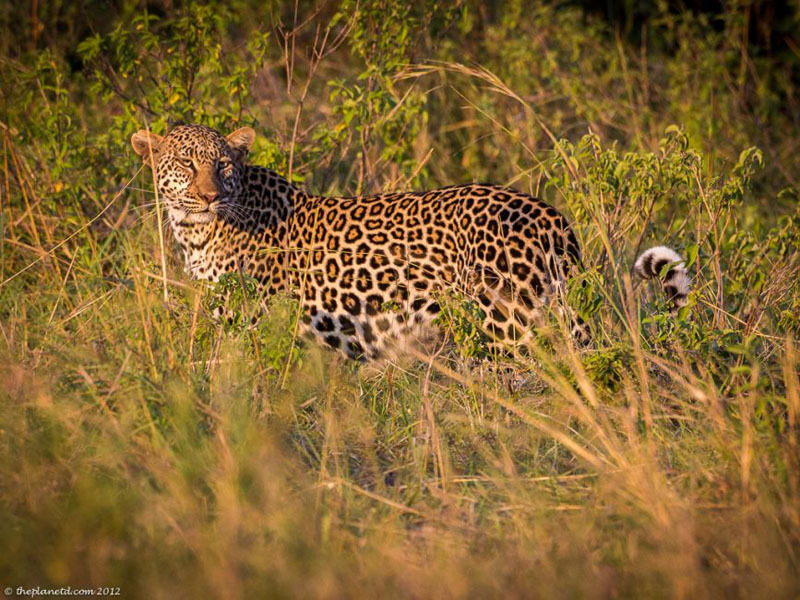 Leopards are “tough” cats and can often be released the next day. Cheetahs on the other hand are highly sensitive and need up to 2 months to recover from the transport alone. Even after that, not all of them can be released, esp. if they have become accustomed to humans. That’s where the main N/a’ankuse estate near Windhoek comes in. It is a vast sanctuary, providing huge areas for animals to roam in freely and live as naturally as possible. Carnivores have their own enclosures, a minimum of 1 ha ((2.5 acres) per large animal. 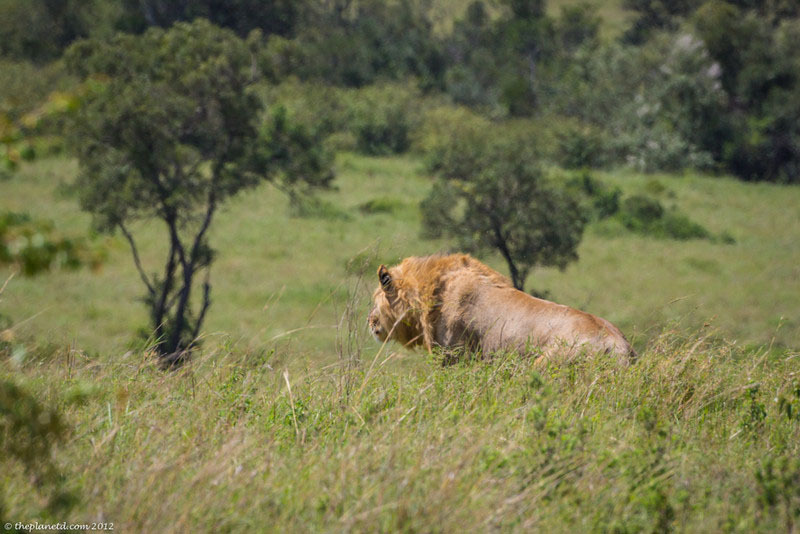 Aside from Cheetahs and leopards, there are currently 3 lions at the sanctuary, as well as characals, wild dogs and baboons. The lions were the biggest I have ever seen. 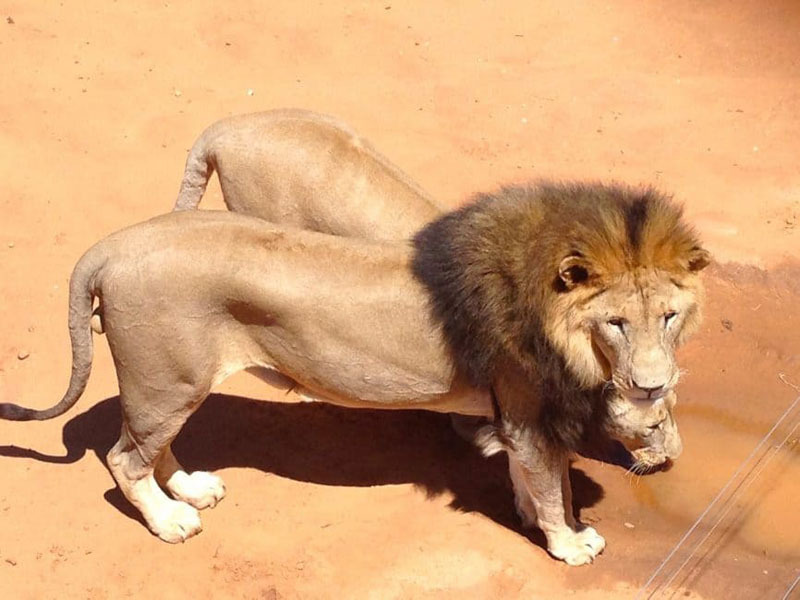 Kalahari lions are much bigger than most other breeds as I learned here. Outside the enclosures, giraffes, zebras, springbok and many other animals (aside from Fudge…) are roaming the property freely. It really feels like living in the African bush. All cats need love. 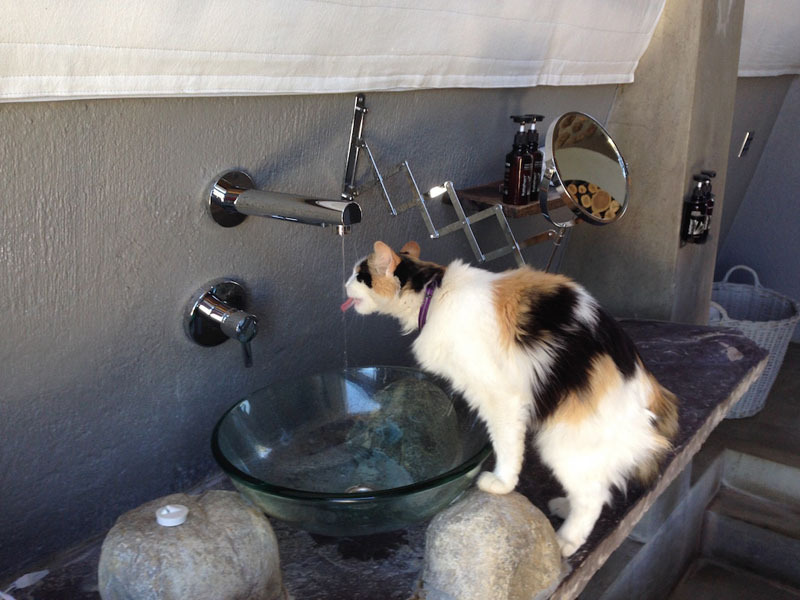 Read about the Cat Rescue Centre in Lanai, Hawaii. The following day started with the experience of a lifetime, a morning walk with Cheetah “Kiki”. To be clear, I abhor any form of petting zoo or abuse of animals in any way, shape or form and was reluctant to participate at first. However, I learned that Cheetahs – unlike leopards, tigers or lions – can become completely tame, especially when raised as cubs. They are very similar to house cats in fact, and even purr. Some genuinely enjoy human contact and at N/a’ankuse no animal is ever forced to do anything. Kiki happens to like people and enjoys morning walks. Her two siblings do not, and they don’t have to go. Kiki walks freely in the bush, without a leash, wherever she wants to go. If she happens to come up to you, you can both enjoy a cuddle – on her terms though – and that was very important to me. During our hour-long walk, Kiki was purring the entire time. That was one happy cat and I’m so grateful she shared her time with me! See how One man is making a difference in Kenya, One Brick at a Time. Later in the day, I went on a “Carnivore feeding tour”. I know….gruesome title, but the experience was awesome. Really! As the name would suggest, you drive on a Safari vehicle to the different carnivore enclosures and have a chance to watch them as they are getting fed. The enclosures are so huge that visitors would rarely get a glimpse of these magnificent creatures were it not for the feeding, and so it was a smart choice and did not involve unnatural coaxing as I have seen in other parks. It also includes cheetahs, baboons, wild dogs and characals. The characals were feisty and not shy at all – and somehow smaller than I had expected. There is also the option to do a characal walk in the morning. They will be released back into the wild soon. A large group of baboons were busy eating and playing when we drove by and in case you think baboons are cute, cuddly animals – they are not! – Even leopards run the other way when they see a group of baboons, because they easily tear a leopard to pieces. Don’t ever go near them, feed them or open your car window if you see baboons on the side of the road in Africa (Cape of Good Hope and Table Mountain are famous for that). They were nonetheless an absolute joy to watch and even verbally communicated with us. The final experience involved visiting the animal nursery for both cubs and injured animals and with it the volunteer program and San children school. Marlice Van Vuuren met Angelina Jolie during a film shoot and both Jolie and Brad Pitt have actively supported N/a’ankuse from the start, incl. 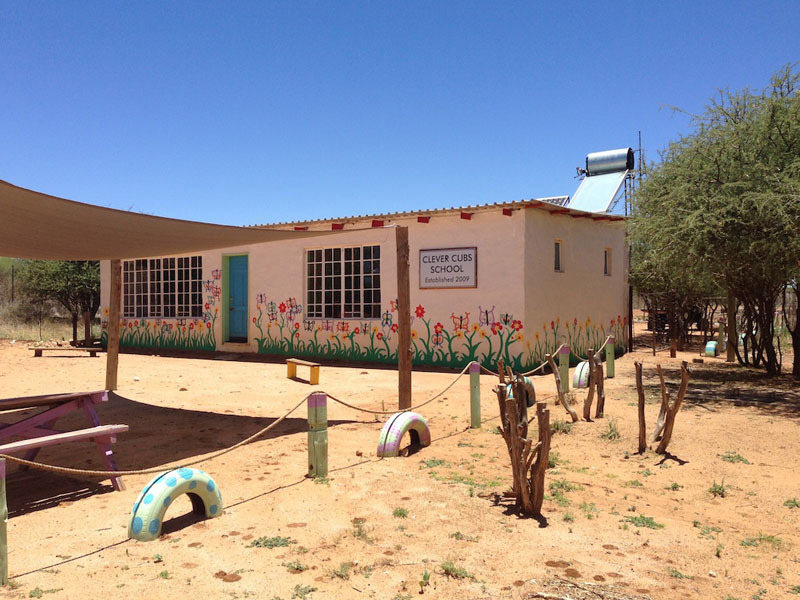 the San children school “Clever Cubs School”. They also come to visit occasionally and apparently have a particular affinity to Namibia since one of their daughters was born there. 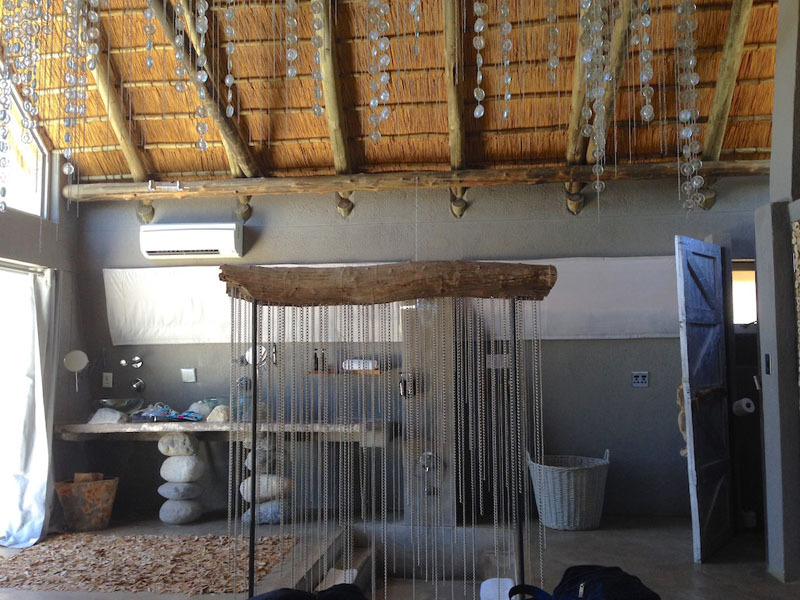 The nursery provided a beautiful culmination of so many amazing highlights during my short stay at N/a’ankuse. Animal babies everywhere, also a few injured baboons and monkeys as well as a horse rescue – and most beloved, the “Affection Section”: a lovely enclosure of tiny baby turtles, dossis, skunks and other creatures – absolutely adorable! 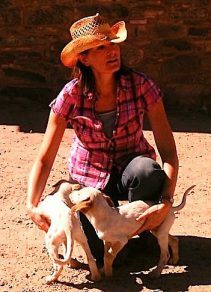 Many people's lives have been changed in Africa, read about Sadie's Travels was changed by volunteering. Dossis are actually related to elephants, in case you didn’t know (although the resemblance should be obvious…..;-) – and they are definitely uber-cute and love attention. Travel responsibly like Gundi. 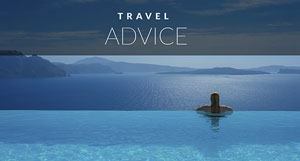 Read: The Importance of Responsible Tourism. The volunteers also live in this area and seemed to enjoy their time immensely. A few of them were partnered with a monkey baby that needed affection and motherly love – and they even slept with them in a special room with nappies and beds. Much too soon my blissful stay at N/a’ankuse came to a end. What a wonderful experience and what an amazing organization to combine so many worthwhile causes in such an impressive way! I hope many more people will get to experience this unusual place – either as a guest or volunteer. It will be the experience of a lifetime! “God is watching over us” – N/a’ankuse…..
Gundi Gabrielle is a Travel Writer, former Carnegie Hall Conductor and Author of the smash hit #1 Amazon Bestseller “BUDGET TRAVEL: The Ultimate Guide”. (grab it now for 99c – limited time offer). 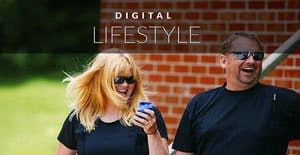 She is Founder & CEO of SassyZenGirl Lifestyle, a consulting firm that helps people from all walks of life achieve Location Independence and Travel Freedom. 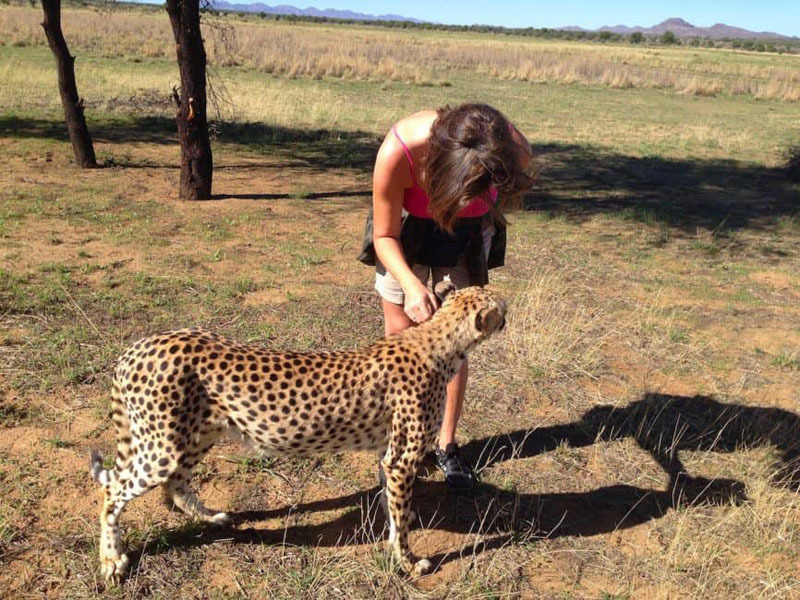 9 Responses to "My Walk with Cheetahs, Learning from the Bushmen & Exploring one of the Most Amazing Conservation Projects in Africa"
Thanks, Mary! – N/a’ankuse is indeed amazing. Have not seen anything like it since – and I travelled for 3 more months in Southern Africa…..
Great introduction to the N/a’ankuse Foundation! 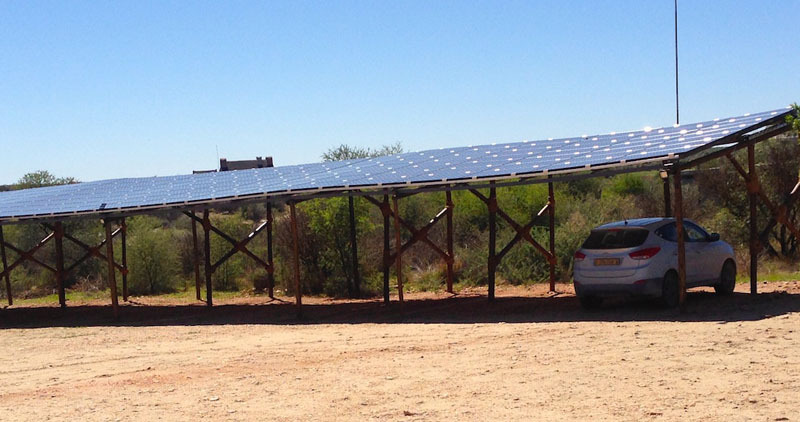 It certainly is a wonderful example of responsible tourism and a productive way to spend time in Namibia. I so agree with you, Helen – and I would never participate in that either. South Africa has quite a few of such “petting zoos”, just like they have canned hunting, and it’s unfortunate. There is a wonderful lion walk place near Victoria Falls though – also free and wild, very similar to Kiki and such experiences are always amazing! – Namibia actually has outlawed breeding of wild animals to prevent those very things and seem very concerned to preserve their wildlife. Anyway, thanks very much for your feedback! This place sounds great, Gundi. I’ve done multiple safaris in Africa and have seen cheetahs in the wild. After those experiences, I just couldn’t bring myself to do the cheetah walk at the Lion Park in Johannesburg because the cats are leashed. That’s obviously not the case at N/a’ankuse, so I applaud them for that! It will be the experience of a lifetime, Tim! – and thanks for your feedback! WOW. Namibia was always on my travel list, but it may have jumped up a few notches now! I always felt like Cheetahs seemed to behave like house cats when I saw them on Safari, and having the opportunity to interact with one would be a dream come true. Great post, I’ve definitely added N/a’ankuse to my list!